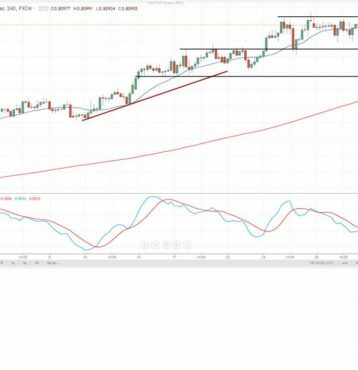 The Australian dollar was trading marginally higher during the London session on Wednesday and was hovering around the 0.81 handle in the morning. The Australian inflation failed to meet expectations and the year-on-year change stayed at 0.6%, while analyst had expected a marginal improvement to 0.7%. The core gauge failed to accelerate to 0.5% and stayed at 0.4% instead. In addition, private credit growth decelerated to 0.3% from 0.5% previously. From the US dollar perspective, the ADP employment report is projected to slow to 186,000 from 250,000 in December. Furthermore, the FOMC monetary policy decision is due and the market does not expect any changes tonight. However, volatility might be elevated today. The AUDUSD pair has been stuck in a narrow range in the previous days and volatility has been lower. The first resistance is located at the current cycle highs around 0.8120 and if not held, further strength toward the 0.82 level might occur. On the other hand, the intraday support is at 0.8050 and afterward around 0.8025. As long as the pair trades above, the immediate outlook seems bullish. In all cases we strongly recommend to have rigorous money and risk management.